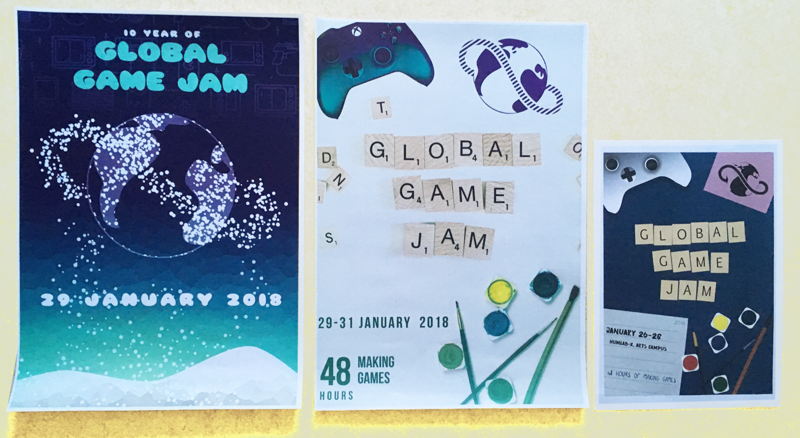 Since 2015 I’ve been the main organizer of Global Game Jam in Umeå. The idea to do that came quite unexpectedly from an acquaintance from another city who used to organize it there. After a bit of hesitation I decided to go with it. It seemed to include all the things I liked to do – posters, video games and talking to people to tell them about this cool event we’re hosting. 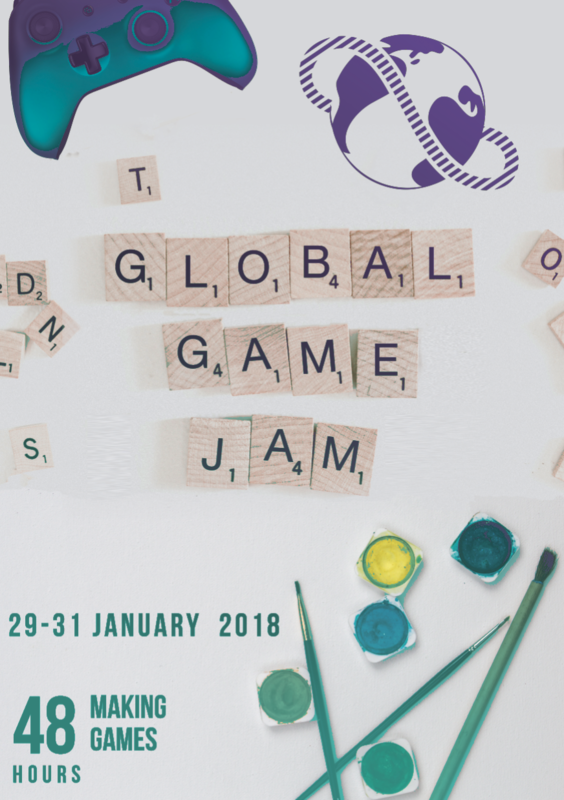 I’ve been organizing GGJ in Umeå ever since. So one thing I want to talk about is creating the visual theme for the posters, which also extends to our website, facebook events, computer wallpapers at the site, and organizer badges. The first year was easiest. I just took the main logo and colors, thrown in some text on top of that and done! But then I saw a poster thread on our organizer channel and the crazy amazing thing other sites were doing! So the next year I tried something more fancy. Each year I try to fit it in the GGJ colors – mostly purple with elements of yellow. This year so far has been the most difficult, and that’s why I’m writing about it. I wanted to do something different, maybe completely stylistically different from what I’ve tried before. I started with the colors as usual. 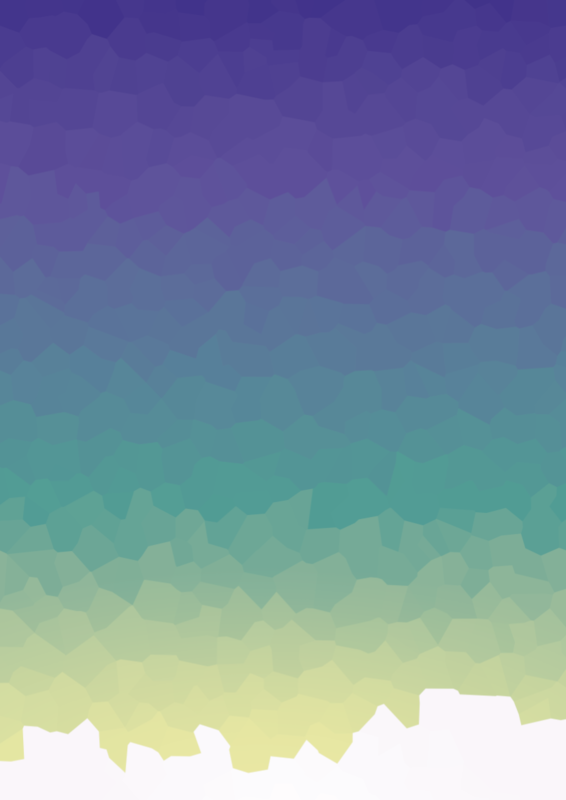 Got an idea for a cool gradient background. Since it’s Umeå – north of Sweden, snow is big part of the identity here so I try to feature it somehow. (But then again, it’s kinda boring to fall back on snow. More on that later.) 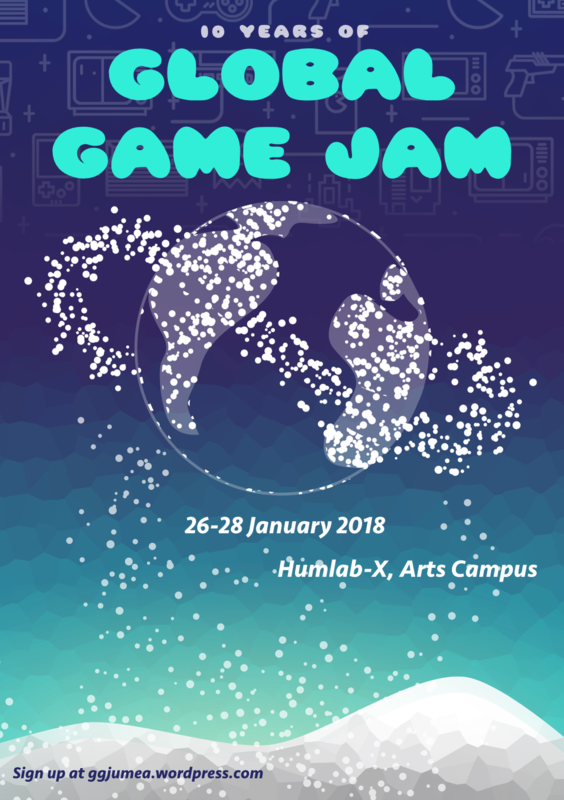 Inspiration struck me “What if I do the game jam logo IN SNOWFLAKES? !” So I did. I love working with the patters that scatter brush can create. 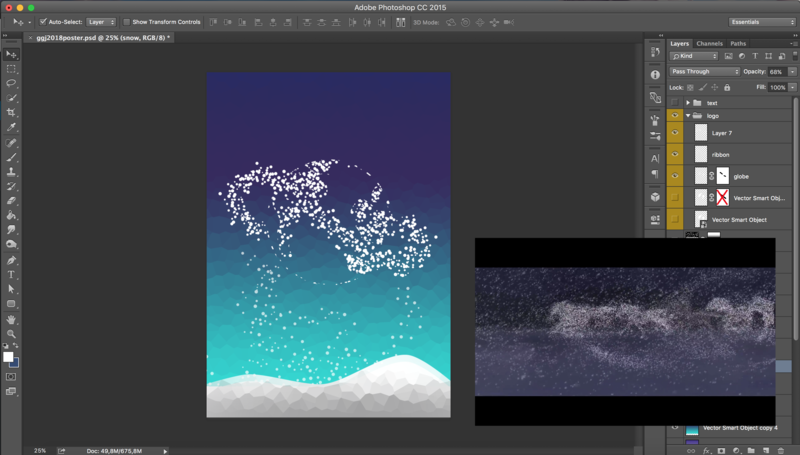 So I started adding more snowflakes – “What if… what if it was like the snow coming from the ground and supporting the logo?!”. We had quite a few snowstorms this year by that time so I was all into the idea of figures in a snowstorm. The image from Spirit, Stallion of the Cimarron popping in my mind there. Meanwhile I also decided to change the background gradient colors, simplify and make them darker to make the snow patterns more visible. While the colors stepped away from the GGJ theme colors, they were still close enough, but also leaned more into the trendy side. The whole design felt really boring though. It lacked some sort of accent color. I tried to smuggle in a bit of yellow, but no matter what I tried it didn’t fit or wasn’t strong enough. Either way, I slapped on some text, a game-related pattern, added a subtle yellow glow behind the snow piles and did a test print. Dissatisfied with the first idea, how boring and invisible it felt for a poster. And I wanted something different, no more snow. I started browsing Unsplash for “game”. Got a few different photos, not of much value, except for one – one with wooden scrabble tiles. 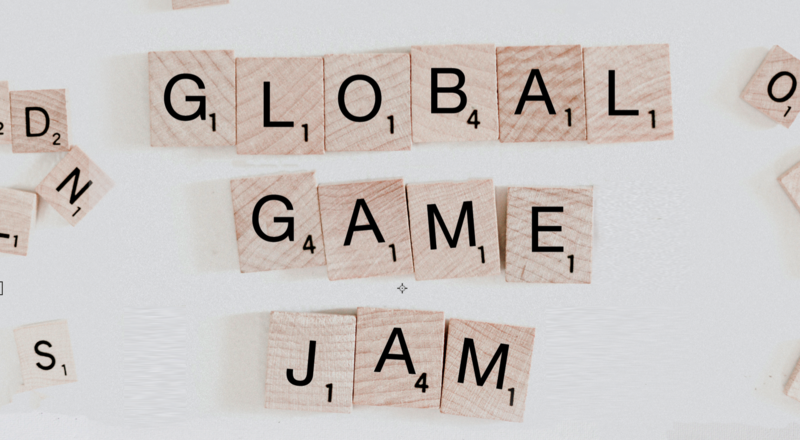 “What if I made it spell out Global Game Jam?!”. That set the style to be more analogue. 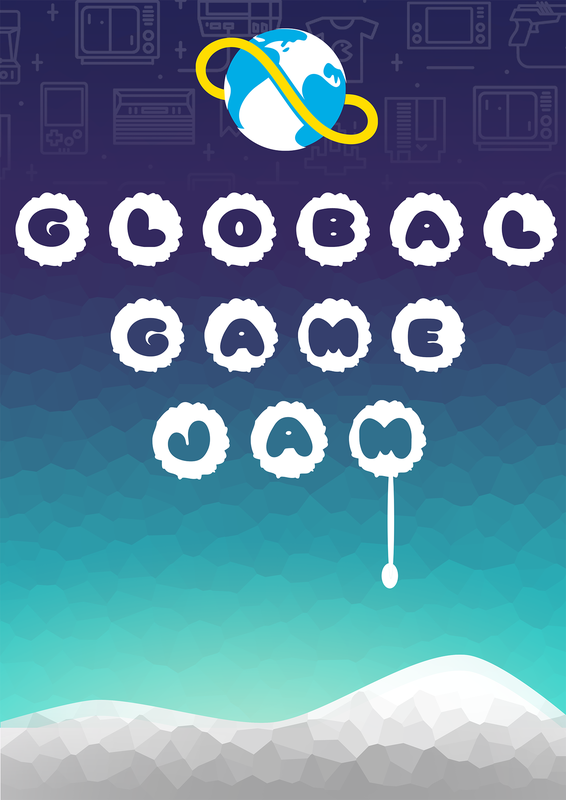 And it was cool, cause Global Game Jam is not only about digital. Last time we had a really cool game done in watercolors and one board game. I wanted to open up for more such ideas with this poster design. Super quickly I threw in some other elements like GGJ logo, an Xbox controller and watercolors. Put the essential info about date and location. And experimented a bit with opacity layers so it doesn’t look like 3 pictures put together in 10 min. Then did a test print. I didn’t feel neither option one nor two were hitting the spot. There were completely different things I liked about each of them – the color scheme of the first and the analogueness of the second one. They had nothing in common and I had no idea how to proceed. So I started to ask people. I rarely do that, at least in that way. I might ask for feedback or if there’s anything wrong. This time I had two vastly different designs, and no opinion of my own. I showed them both to people and asked which of them they feel more attracted to at the first glance. Posters are not something you tend to stare at and analyze, so I didn’t want people to analyze them. But, it was the confused looks that told me the most. Right after asking people to choose one, no one instantly pointed, they looked as if none was good enough. It’s a different look when people like two things and can’t decide, and different when they have to select a “lesser evil”. The look I saw was the latter. I shared that look. With not much left until we have to announce the event I knew I have to just select something and go with it, for better or worse. So I chose the second version, after all it got more votes, and among people normally not interested in games, so had a potential to attract new demographic. What bothered me the most about that one was the white background, so I looked for ways to change it. Given it was a photo and there was no easy way around it I decided to quickly vectorize it and experiment with backgrounds. Oh boy, the many colors variations I tried. Nothing seemed to work. The evolution of version 2. Testing different colors. Nothing really sticks. By vectorizing it I lost the most unique aspect of the original idea. And again neither the original nor new version were good enough. Weeks passed by. I dreaded opening Illustrator and seeing this ugly thing staring back at me. Until the event was so close there was no more time to waste. I had to make SOMETHING. At some point before listening to people and continuing with the analogue poster I got this idea of transforming scrabble into snowballs. I asked one person for feedback back then. He completely ignored this third option – to be honest, there wasn’t much to it back then, just letters in circles. But that same person also shared a good insight about people paying attention to shapes and patterns that people recognize. Which eventually shaped the final idea. I liked the background of the first poster. I still liked the snow idea, as boring as it is, I loved the scrabble photo and I loved how the Xbox controller somehow tied it back to games. I started with fixing the shape the melting snow part. Duplicated it and added to other places. Moved around the text. Eventually replaced the snowball behind jam to shape a controller (that familiar pattern that I mentioned earlier). At this point I found the confidence and satisfaction from the design I lacked all this time before. It became so fun again to work on it! It still seemed a bit barren and not particularly entertaining, so the final touch was adding a snow cannon at the bottom and branding it with GGJ logo and “making games since 2008” as a celebration of GGJ 10-year anniversary. Here’s the development of the final version. So here it is, the journey to find the right design. Long and frustrating but in the end satisfying! PS. The final version really happened at the last moment. But it was so fun that it didn’t matter when I was working on it. When I exported final pdf and sent it to print, I finally looked at the clock and it shower 7:30 AM. Lol.